Note: This is, for the most part, a transcription of a conversation between my father, Joe, and yours truly on March 21, 1983. Joe was listening to a tape he’d made with his uncle, Aaron, in Rio de Janeiro. Ezra was kind enough to OCR-scan the text so I could post it here. I’ve added some photographs from a box of family history materials I inherited when Joe passed away in 1989. “A” marks Mogilev-Podolsky. 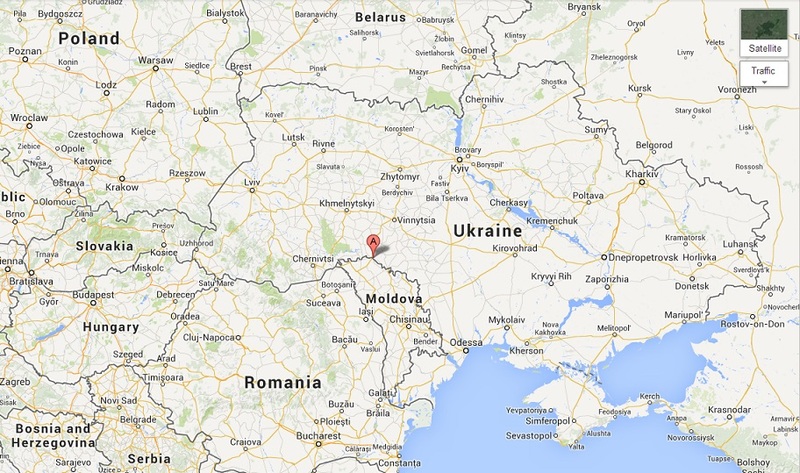 It is, today, located on the Ukraine side of its border with Moldova. “Chisinau” on the map is Kishinev. The family hometown was Mogilev-Podolsky (or Mohyliv-Podil’s’kyi), then in Russia, on the eastern side of the river Dnestr. The map shows this to be in northern Moldavia (see map’s caption, above). Joe’s mother’s family were named Diamant (or Diamond). Aaron is Joe’s mother’s brother – Joe’s mother was always known as Betty to me, but her real name was Brana. There were three other siblings: Yasha (the oldest, a brother), Riva (a sister), and Jenny (another sister). The town was apparently a sort of Jewish ghetto — of 300,000 population, 250,000 were Jews. Apparently, too, Jews were allowed neither in big cities nor in places within 200 kilometers of the Russian border (note: Wasn’t 300,000 a pretty big town?). Jews could not own property. 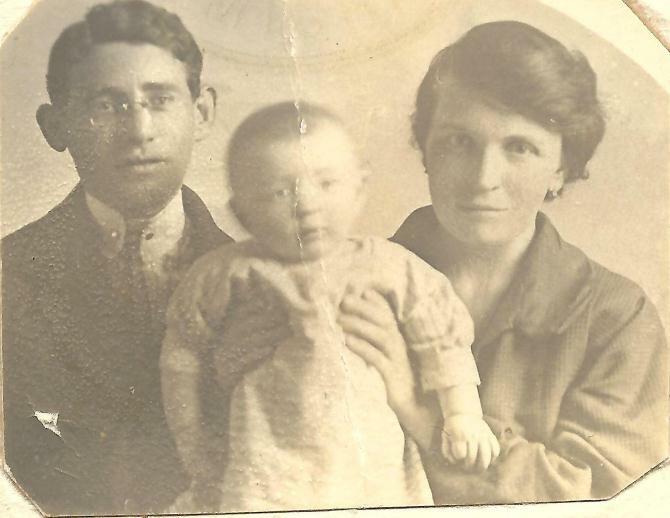 Mendel and Charna Rabinovitch, great-great-grandparents on my grandmother’s side, managed a farm–partly because they could not, by law, own one themselves. According to Aaron, they were very good farm managers. On my grandfather’s side, all that Aaron remembers of Itzhak Roizen is that he “sold supplies”–a dry goods store, a peddler, what? He was relatively well off. 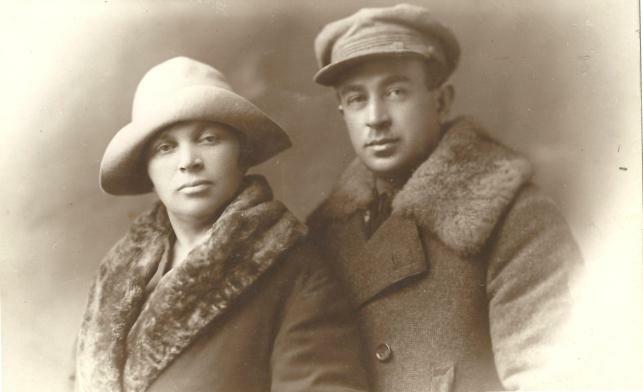 Boris, Itzhak’s son, my grandfather, had two sisters, Kroina and Esther. Esther had wanted to move to Canada, but her mother was too old to travel, and so she waited for the mother to die. The mother did, in 1928 or 1929, and Esther came over. My father still remembers her coming. Apparently she herself died relatively soon after arriving. Nothing was said of Kroina. As Aaron told the story, in the time of the Czar the Diamant family did quite well. They could afford to send the children to school, where they learned languages and so on. That the children “didn’t have to work” seems to be the relevant mark of good financial standing. Aaron’s father, Joseph, was in the wine business. My father mentioned that at times the family’s feet would be red with crushing. Joseph, and his wife, Sarah, also ran a tavern, and apparently this vocation provided them with a means for avoiding the wrath of some of the pogroms that were visited on Jews. They could wine the Cossacks and also, perhaps, hide more easily at times. According to Aaron, for Jews there was a relatively stable and peaceful time between 1905 and 1917. The former year saw a massive pogrom prompted by the Czar (?). When the communists took power there were many consequences. They took half of one’s possessions. They quartered people in “underoccupied” houses. Five extra people were sent to live with the Diamant family. Apparently, too, the family piano was destroyed — it being too much a mark of patrician status. As it happened, Aaron had certain resources in the situation. First, the head of the Communist police was a man named Miyas Dorman, who apparently was a school chum of Aaron’s. Dorman was a Jew. Aaron was also a good artist (so was Riva), and he was pressed into service to draw socialist posters, pictures of Lenin, and the like. For this he received food. And because of this function he was pressured to join the party. This, because with party membership he would be “cleared” to draw up secret plans and so on. Aaron”‘s grandmother is said to have said she would kill Aaron if he did join (saving him from his reason for joining, which was survival). In any event, Aaron’s account now seems to tell of the shifting circumstances for escape in the years immediately after the revolution. The picture seems to be that escaping got tougher and tougher. The pressure to escape, though, also increased. Now, Jews were starving. In fact, Joseph Diamant, Aaron’s father, did die of hunger in 1918. For a year the family had no potatoes, no meat, but subsisted on mamaliga, a cornmeal porridge. The kids — who were not accustomed to this sort of thing — actually went out into the field and tried to grow food for a year or so. The father was not strong to start with, and was the first to perish. Yasha, the oldest brother, was some sort of mechanic, and a good one and could travel, apparently, for business. In Austria he made arrangements for a U.S. visa. He left in 1921, before strong U.S. restrictions came into effect. Yasha moved to Philadelphia. Riva apparently had a “Russian” (non-Jewish) boyfriend who was a communist. I recall from another conversation with my father that she had had high hopes for the revolution, and had gone to Canada in order to send money back for her boyfriend’s post-revolution support. She worked in Canada in a cigar factory. There she contracted tuberculosis and died. 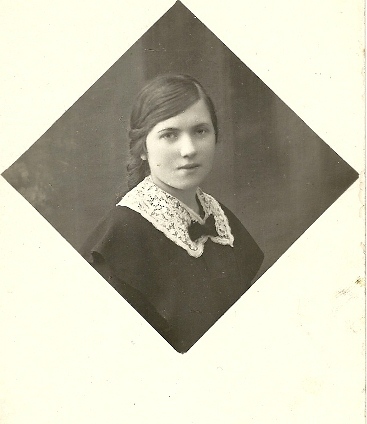 My father remembers her as she a nice aunt, who often cared for him, read him books, and so on. I once saw a picture of her, she was a bit fetching. Jenny stayed in Russia. She was a schoolteacher or a university instructor. Joe tells the story that in 1959, when he went to Russia for the trade show, he wanted to see her, but the Russian government would not permit it. They said she lived too near the border. In spite of both their efforts no meeting was accomplished. Aaron himself escaped at a more difficult time when it was necessary to bribe Russian border guards. He told that a bit earlier in time it was possible simply to hire a boatman to take one across the river. Apparently, though, after a while Russian boatmen began to figure out that departing Jews often carried a good deal of money. And so, Jews would be killed and robbed. Word came back to Mogilev-Podolskiy that some were not making all the way to Romania. Aaron escaped in winter, when the river was iced over. He had the bad luck to bribe the guards for a night when a full moon shone brightly — “bright as day,” he said. Thus, the guards had to make at least the appearance of trying to shoot him. He was in fact hit in the heel and crawled over the ice to the middle of the river, where Romania officially began. On the other side of the line, he stood up and raised his hands for the Romanian border police. They asked him if he were a Red. Aaron had been informed that saying yes to this would simply invite being shot, and so he said no, which in any case was true. Thereupon the guards marched him through town to jail. Aaron had a rich uncle in the Romanian border town. It was this uncle who arranged for bribing Russian soldiers and bailing-out newly arrived escapee-relatives. The story goes that Aaron had to get word to this uncle that he had made his escape and arrived in town. As luck would have it, the border guards marched him right past the uncle’s house. “Uncle,” he said, “your nephew, Aaron, has arrived and needs your help down at the jail!” The uncle heard. Hi Ron. I’m Michael Diamond, grandson of the person you are referring to as Yasha, though I knew him as Pop Pop Joe, so a bit confusing. To make matters worse, my recollection is that his Yiddish name was Yankel. I’m also Lisa’s brother. Joe, as I knew him, left via Hamburg and made it to NYC where he attended Cooper Union and became an electrician. 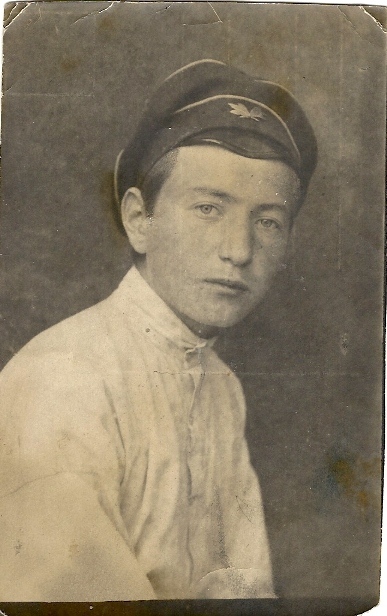 He had been influenced by the Bolsheviks and left home at a young age, rejected Judaism and went to work in Odessa as a translator of business letters from French & German. He remembered Cossaks coming to town and breaking windows while they hid inside. He also recalled that a major form of entertainment was for the Jewish boys to stand on one bank of the Dniestr and the goyim on the other and throw rocks at each other. When Joe got to the states his intention was to support the union movement, but he decided it was too corrupt. He moved to Philadelphia where he worked as a millwright as well, keeping the complex system of central belts operating that powered most shop machinery at the time. He converted a great number of the houses in Philadelphia from gas to electric. He also worked in the Philadelphia Navy Yard and survived the Great Flu Pandemic. Apparently there was a 30 year silence between Joe and his younger brother Aaron. The explanation I heard was that Joe paid for Aaron to move to the US, but Aaron got side-tracked by Luisa in Rio de Janeiro and stayed. I remember meeting Aaron and Luisa and my Aunt Bessy from Canada in the 1960’s when they came to stay at our house. I think my love of coffee and Brasilian music dates back to that visit….. Thanks very much, Michael, for adding this new info about your grandfather, Yasha. BTW, He’s mentioned in my brief sketch of my father’s life in relation to the help Yasha offered my father’s little family in getting to the New World (see today’s post at my blog). Also, and if I’m not mistaken, my father, Joe, and his sister, Molly, were named after your grandfather and grandmother. Among other things I read a lot of gratefulness and respect into that selection of names. I’ve been in email-touch with Lisa for some time now — it’s nice to finally “e-meet” you as well! Same here! Not sure about naming after, though the parallel is striking. I think your father was born while my grandfather was still alive. If they are named after them it’s odd as it goes against the Ashkenazi custom of not naming after the living. Who knows. All I know is that generation, Bessie & Joe(Yasha) and Aaron were tough. This is cool stuff. Thanks for doing the research. Ron: My Aunt Molly, my father’s younger sister, very kindly and helpfully emailed me last night from her home in Tucson. Molly’s email, all but a little of which is presented below, highlighted for me how much my post focused on the maternal, Diamond side of the family and not the paternal, Roizen side. Indeed, it would have been better titled “Some Diamond Family History.” Now Molly has ridden in on a white horse, so to speak, and filled-in some valuable information on the Roizen side. I’ve offered some comments, below her email’s text, on some of what she’s written. Many thanks, Molly, for taking the time! Ron again: As already noted, Molly’s email goes a long way toward filling in the Roizen side of the family tree. Regarding the Roizen-Rosen name issue, she mentions that using “Rosen” was the innovation of “Boris’ brother Joe who migrated to Philly.” But I’m not entirely sure, and will ask Molly, who this “Boris” refers to. If it’s Molly’s father (one of my middle names is “Boris” and I was always told it was in honor of my paternal grandfather), then Molly’s grandparents had four children instead of the three I show in my crude family tree, two girls (Esther and Kroina) and two boys (Berl and Joe). This “new” brother, Joe, also raises the possibility, even the likelihood, that my father was named after his paternal uncle Joe and not his maternal uncle Yasha. Molly’s comments about her own name also confirm that Michael Diamond (see above) was right and I was incorrect about whose namesake Molly was. There is, incidentally, a photo of Esther and her husband, Abe, (see 13f) over on the “Old Roizen Family Photos” web page (http://www.roizen.com/ron/oldroizenfamilyphotos.html). Molly noted that Esther and Abe had no children but Kroina and Isaac had six. This is entirely new news to me and suggests, of course, that there may be quite a number of Roizens (or Hoffmans) of my generation, of my children’s generation, and even of my grandchildren’s generation living and breathing on Long Island or distributed elsewhere in the U.S. Quite a cargo of great stuff, Molly! Thanks very much, again! (1) Kroina married a man named Isadore (not Isaac, as Molly wrote) Hoffman. He ran what Carole described as a “chicken market” in Maspeth. (2) May Hoffman married a man named Herbert Schwartz and they had three children. Carole Priven’s contact with Ezra represents the first real communication between Berl’s descendants and his sister Kroina’s descendants. I’m hoping that a wider exchange of information and family memory will result from this (dare I say it!) thrilling new development on the family history front! Footnote to the above: Oh boy, I must be getting old. I wrote, above, that Molly’s words about the Hoffmans were “entirely new news to me.” But Molly actually covered some of this same territory in her remarks on photo 25f over on my “Old Roizen Family Photos” web page (http://www.roizen.com/ron/oldroizenfamilyphotos.html). I’d forgotten. Oy! Would you have found someone called Levy Roizen who came with his family to Brazil? Rachel added: By the way, he was the brother of the great great mother of my mother, and it seems that he came from the city that you mentionned. He came first to Rio de Janeiro and after went to Salvador da Bahia.